From Kauaʻi’s eastern shore to Mount Waiʻaleʻale, Wailua welcomes each day and reveals its beauty as the sun rises. The sandy beaches, gentle Wailua River, verdant uplands and lofty mountains graced by waterfalls are warmed by the sun and cooled by easterly tradewinds. Discover Wailua’s beauty and history. This interpretive project is sponsored by the Hawai‘i Tourism Authority under a Heritage Corridor Program grant. In ancient times, Wailua served as a main port of entry to Kauaʻi—a gateway that also ushered and welcomed the daily rising of the sun. Stories tell of the arrivals of famous voyagers, chiefs, and deities including, Moʻikeha, Kaweloleimakua and Hiʻiakaikapoliopele. The legendary surf sites of Makaiwa, Kaʻōhala and Kalehuawehe are also located here. ʻOpaekalaʻole are native fresh water shrimp that were once plentiful in the mountain streams throughout Kauaʻi. Translated, “ʻOpaekaʻa” means “rolling shrimp” alluding to its one-time abundance and images of ʻopae tumbling over in the cascade of the waterfall. Kamokila and Kawelowai were giant moʻo or lizard ʻaumakua—spirit guardians that watched over the fresh water and land resources of Wailua. Steeped in Hawaiian oral traditions, Waiʻaleʻale mountain represents the piko or navel of Kauaʻi. Its peak, Kawaikini is the highest point on the island at 5,243 feet. Reputed as one of the world’s wettest spots, it averages 400- to 600-inches of annual rainfall. It is also home to Kauaʻi’s main watershed, Alakaʻi. “Sleeping Giant” This celebrated mountain served as a prominent setting for the illustrious battle that was fought between the powerful warrior chiefs known as ʻAikanaka and Kaweloleimakua in the 17th century. The popularized name, “Sleeping Giant” comes from the legend that tells of Puni who fell asleep upon the ridge and eventually turned to stone. The mountain ridges of Maunakapu and Nounou divided the Wailua ahupuaʻa into two sections. Wailua Kai, traditionally referred to as, “Wailuanuiahoʻano,” encompasses about 2,800-acres of land seaward. Wailua Uka is comprised of more than 17,455-acres. Altogether, the valley provided all of the resources and necessities to support the chiefly retinues, along with the populace of makaʻāinana who cultivated the lands and provided labor for the ruling aliʻi. This is part of “the long spine of Kane,” an ancient pathway that once led to the summit of Waiʻaleʻale. Chiefly pilgrimages were taken to reach Kaʻawakoa heiau that was dedicated to the god, Kane. Ceremonies were conducted there to ensure a continuous supply of fresh water to sustain the people and lands of Kauaʻi. Other surrounding mountain landmarks here include Maunakapu to the south, Nounou to the north, and ʻAʻahoaka and Waiʻaleʻale to the west. Oral traditions tell of the sacred births of Kauaʻinui and Wailuanuihoʻano and the establishment of this area as a birthing site reserved for royalty. It is still considered as one of Hawaiʻi’s most sacred sites. Kauaʻi’s king, Kaumualiʻi was the last chief to be born here. On the southern banks near the Wailua river mouth is Hauola —a place long associated with the traditional practices of health and healing. The adjacent Hikinaakalā Heiau served as a place to worship the sun. It is said that the entirety of Wailuanuiahoʻano was a puʻuhonua or sanctuary of peace and safety. “Fern Grotto” was known to the ancients as Maʻamaʻakualono, this area was dedicated to the akua nui or major god, Lono. Mostly associated with the occupations of agriculture and cultivation, Lono was also important in the practices of healing. The popularized name, “Fern Grotto” comes from the long Boston Sword ferns which hang downward over the cave. 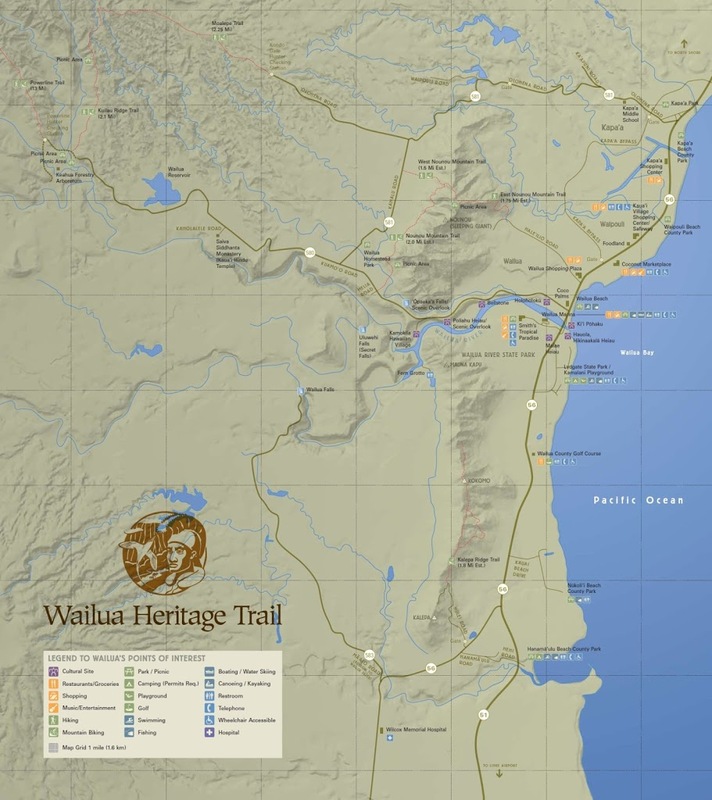 Text and many images are from the Wailua Heritage Trail website – click here for more information.